Any lingering hopes Biggar Rugby Club had of getting promotion this season were extinguished by Friday night's 15-15 draw at Whitecraigs, writes Alistair Stewart. Biggar are now in fifth spot in BT National League Division 2 but with Peebles and others in close contention and with games in hand. Biggar were without a couple of key players, Carne Green having now returned home to NZ, while Ewan Stewart was unavailable due to illness. Neither absence can be levelled as an excuse however and there was considerable frustration again within the Biggar camp at the inconsistencies of performance. Possessing a huge pack Whitecraigs did much to deny Biggar any quality possession for large chunks of the game and as a result they just couldn’t manage to string together sufficient phases to break down the ‘Craigs defence. The game opened brightly enough with flanker Gregor Stewart taking full advantage of a ‘Craigs overthrow to pinch possession before rounding the cover defence for a good try in the corner, though just too far out for Euan Bogle to strike the conversion. ‘Craigs replied some 10 minutes later with a second opportunist try, this time for their scrum half who exploited a gap in the Biggar defence to nip through for a try from some 20 metres. 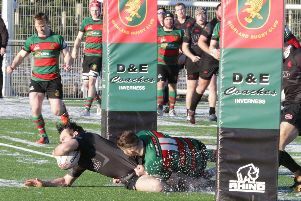 This try was also unconverted and this was the case for the third try of the match, this credited to the home side and which gave them a 10-5 half time lead. Biggar would have expected to kick on from here and in some respects this is indeed what they did, Bogle striking a penalty to reduce the deficit before adding a conversion to a try from centre Ryan Moffat, this a try he set up with a good midfield break. Jamie Orr took play forward from the Moffat off-load and then the centre regained possession to barge over. The 15-10 score was a whole lot more encouraging but a susceptibility to concede penalties, something which this squad have not been particularly guilty of, reared its ugly head. This gave the home side the initiative and the opportunity to maintain pressure on the visitors and the inevitable then came to pass, namely a yellow card to centre Robbie Lavery – the second in as many games, and this a ‘team’ yellow in that it was for persistent infringement. Down to 14 men Biggar’s chances were then further reduced with a second yellow, this to replacement Callum Dunlop, which meant for an approximate 5 minute overlap, Biggar were 2 men down. Dunlop had come on in the first half for Calum Braid who aggravated a shoulder injury. Rowan Stewart had replaced Alistair Sinclair at half time. Having defended pretty well Biggar then put themselves under pressure by failing to clear their 22 properly, ‘Craigs taking full advantage to launch a series of pick-and-go’s from the pack. This eventually paid off, with space created on the wing for the ‘Craigs winger to squeeze in at the corner. A successful conversion and the win would have been just reward for ‘Craigs efforts but from a Biggar point of view the ball happily missed its target and so the game was drawn. ‘Craigs have only had one win this season and so this was their second best result. For Biggar it marks the end of any promotion hopes they may have had although as they have the top 2 still to play, they will have a major say in which teams do finally get the two promotion spots. First up however is Preston Lodge who come to Hartree Mill on Saturday. Biggar will be looking to regain their form and ensure they gain a good home win.